Day 618 - Happy Halloween! Greetings, Bloggy Ghouls and Bogeymen! Charlie is hunting, but he should be around later to see the handful of trick or treaters we'll get this afternoon. I always miss them, so I don't know how cute they looked! Charlie, please encourage them to take more than one piece of candy per kid! I am sure I told this already, but last year we left a tub of candy out on the doorstep for the kids to choose what they wanted. Charlie was out back, but came to the front just in time to see the kids struggling with the LID on the plastic container! They couldn't GET to the candy! The lid was 'pull off', and they were trying to turn it. We'll leave the lid OFF this year. I have the bucket sitting by the door. So, Karen, tell us, what kind of candy did you buy this year? I have a mix of Reese's Peanut Butter cups, a couple snickers bars, a few mounds bars, and some Halloween 'bats n jacks' pretzel packs for non-candy-lovers (if there are any). Going trick or treating in Connecticut with NO parents - just kids. No fear in those days. Having so much candy you needed a pillowcase to carry it all. Having full sized candy bars vs. the miniatures. Having people give you quarters instead of candy. Trading candy with your siblings and friends. We had a neighbor in Massachusetts who was a dentist. He gave out toothbrushes instead of candy. Not a problem. Day 617 - Monday is GONE, Tuesday is BETTER! If I am anything like Charlie, I'll be having doctor and dentist appointments every other week. Charlie has had a bunch of those since he retired. Hang in there Charlie! We went out to eat last night with TY and SY at a pub-style place named Sam Hills in Columbia. On their menu (printed before smoking in restaurants was banned) it says 'Please, no clove cigarettes'. I have never even heard of a clove cigarette - have you? You learn something new every day! Now why THIS restaurant needed to print it on their MENU, I'm not sure. They must smell very 'clovey' and stink up the place. Speaking of the place... Our waitress was 50 watts shy of a 60 watt bulb. Must have been the extreme weight of her teenaged braces. She overcharged us and undercharged TY and SY, and didn't have a clue about either mistake. The restaurant was complete with an outdoor patio area - a.k.a. smoking lounge, festively decorated with year round blinking Christmas lights (need I say more?). A couple of serious rednecks were out there letting their 4 or 5 year old kids play around them as they smoked. When we were leaving, one asked Charlie if 'he had a belt or something to run along the slats in the fence to make the kids stay put'. Count your blessings, folks, and have a nice Tuesday! Day 616 - Red Sox Win! Greetings, Bloggy Monday Moaners and Groaners! Moanday again. Congratulations to the Red Sox for sweeping the series! I was a little afraid when the Rockies scored their first run that they wouldn't be able to hold on. I think Beckett and Pedroia were my favorites in the Series. We FINALLY went to see 'Resident Evil - Extinction' yesterday, more than a month after it opened. And yes, they left a big segue at the end for another one (or more) in the series. If you are not already familiar with these movies - the Resident Evil movies are sci-fi zombie action movies, where a virus has turned most of the people on the planet into people-eating zombies, but a few survivors and a few 'superhumans' have not contracted it. I think they are based on a video game like the 'Lara Croft' ones are. Last night on 'funniest home videos' they showed various little kids in over-large costumes that made them fall over. A little baby dressed like a pumpkin was a favorite, and a little boy dressed like Gumby. The Gumby costume was very accurate, and unwieldy for the little boy. He tipped over on someone's doorstep and lay there patiently on his back until the occupant came outside to pick him up and give him his candy. Lyn - last night I dreamed that Mom and I were watching Christopher, who was a very small baby. We were going to go to the grocery store. I was going to put him in my lap, but in my dream I chided myself that holding him in my lap was against the law, and I was going to have to put him in the carseat! Day 615 - Sunday again! I've been busy this morning so this will be just a click and a promise. We're going to go swim this morning, then maybe hit a movie. TTFN and sorry for minimal bloggage! Greetings, Bloggy Fans of the Fall! Our heat came on this morning! I arrived home from work (after putting in 16 hours of overtime the last 2 weeks) and Mr. Charlie, our beloved retiree had made meatloaf! He had the idea, he looked up a recipe on the internet, and made it 'per specifications'. What a guy! I'm off to water aerobics soon, wearing my new pink and black tie dye 'Speedo Endurance' swimsuit. This fabric is supposed to be very chlorine and fade resistant. We'll see about that, but since my water aerobic instructor swears by it, I do believe her. I don't remember what I dreamed about last night. Countdown to the end of the month is ON! November and the holidays coming up FAST! I have a short work week next week, because I'm heading to Gatlinburg for a long weekend with some gals I used to work with. I am SOOO looking forward to that break. Oh, gee, I'll be out of the office for the end of month processing. What a shame to miss that! TTFN folks, have a nice Saturday and stay warm! Don't forget to watch the World Series game tonight! Day 613 - Friday, Hooray! Greetings, Bloggy Weekenders! It's Friday! Yes, I'm gonna say it! 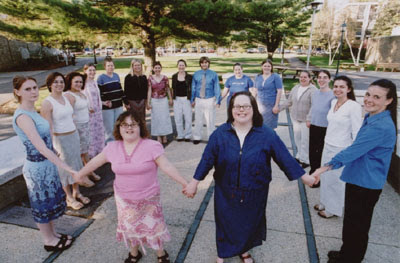 You know what to do - march in a circle chanting 'Fri-day! Fri-day! Fri-day! ' That feels better, doesn't it? Speaking of feeling better - the kink in my back worked itself out yesterday. Good. I fell asleep during the World Series game last night when the score was 1-1. They won anyway. Good thing they didn't wait for me to wake up and watch. No big weekend plans here - how about y'all? I'll just enjoy water aerobics and relaxing, maybe some shopping. Speaking of shopping, I stopped at Wal-mart (alias Squall Mart) yesterday to pick up a few things. $50 worth of things. I bought some Reeses Peanut butter cups to give out at Halloween. I tried to use a coupon in my purse for them, and the guy at Wal-mart said it was only good at Target. I didn't argue with him because it did have a target bulls-eye on the corner. Curses, foiled again. Hey! A funny thing about one of my dreams last night. I remember saying in my dream something like 'Hey - this place looks like something I've dreamed about!' Have you ever dreamed that you saw something from a dream? It was actually a very seedy place in Las Vegas, full of people in various stages of intoxication. That may be normal for Vegas I guess. I spent most of the dream looking in every closet for my pocketbook. I actually found OTHER people's handbags, but not mine. What was that all about? Have a great Weekend everyone and enjoy the World Series! Day 612 - Wow! What a Game! Holy Harvard, Batman! What an opening game of the World Series at Fenway in Boston! We'd better put Beckett and all the 'heavy hitters' last night into the Super Hero category. They brought in so many runs we could hardly keep up with the score. Boston set a record for runs and victory margin in an opener. They had 17 hits. They are the first club with eight doubles in a Series game since Pittsburgh in 1925. (oh yeah, as if I remember that one). Rockies relief pitcher Ryan Speier walked three straight batters with the bases loaded - the first time that has ever happened in the World Series. Oops. I hope the fans didn't mind the rain too much, falling into their foamy Sam Adams beer and onto their delicious Fenway Franks - they got to see quite a game. I had turkey kielbasa with whole grain mustard for dinner, and Charlie and I both had ice cream sundaes later on. I pulled something in my left shoulder blade or back last night. I got up to use the restroom at 3am, and YAWNED while stumbling back to bed. That twisted something. A YAWN. Sheesh. It especially hurts if I reach for something. Guess I'm getting old... (sympathy groans from the studio audience while violins play that 'Darling, I am growing older' song from old Popeye and Betty Boop cartoons). Gotta go! I'm on my second cup of Foame' Latte! Thanks, Charlie! Day 611 - Batter Batter S-wing Batter! It's Wednesday already, and that means the first game of the World Series starts tonight! I'd better check my supply of hot dogs and popcorn. I have the BEST stone ground grainy mustard in the fridge, the brand is Inglehoffer. It is awesome. We have a 'blended family', meaning we have both Red Sox fans and Yankee fans in our bunch. I will go out on a limb (or maybe lose a limb) by saying the majority of the family are Sox fans. Makes for interesting conversations when they play against each other, as well as a fashionable mix of official Team clothing. I don't have a single piece of clothing from either team, myself. All the Yankee fans will be rooting for Colorado, you know, just to spite the Sox. If you are a Yankee fan but are rooting for the Sox in the Series, please post a comment so I can fall on the floor. I am working from home this morning, but going in at 11 so I can go out for a free lunch with my manager and a vendor. My manager wants to go to P.F. Changs, which is one of my favorites. Don't want to miss that! Not a bad life if you ask me... Have a nice Wednesday and enjoy the ballgame tonight! Newsflash - I went to water aerobics last night and they announced they will bring back Tuesday night water aerobics sometime in November. That is awesome. Last night's class was fun because the Saturday morning water aerobics instructor was one of the attendees. She said I'll be the one who notices if she steals any 'moves' from the Monday night instructor. I said I wouldn't tattle on her. Did I tell you they have an 'aqua Tai Chi' class on Monday mornings? Changing subjects - weather news!! It finally rained for most of the day yesterday. That was the first real, soaking rain since I-don't-know-when. It is still raining today and the more the merrier in my opinion. My car looks clean again. Well gang, gotta get at it! TTFN and have a nice Tuesday! Day 609 - Congratulations, Red Sox! Greetings, Bloggy Worker bees and Sox Fans! It's Monday, and I'll bet there are a lot of sleepyheads out there! Who stayed up to watch the Red Sox win last night, and the big celebration afterwards? I stopped watching when it was 6-2 and fell asleep. Charlie watched it all, I believe! The Sox got two early runs, AND had the home field advantage. Cleveland just couldn't get much going. They acted like they'd given up already, in my opinion. Congratulations, Red Sox! Win that World Series! I dreamed last night that my mother had a laundry room in her bedroom with a 'swimsuit water extractor' machine that was big enough for towels. This is a machine they have in the health club. It is a high speed spinner that takes the water out of a swimsuit. We were waiting for the boys (my son and his friend who were around eight or ten instead of thirty) to have their showers so we could spin up their towels. My cousin Cathy was visiting and she was going to help. Changing subjects and changing weather - we are expecting RAIN this week and a cool down. I hope it rains so much we get sick of it. This has been an awful drought year. Sorry gang, it's 6:09 already and I need to get ready for work! TTFN! It's Sunday, and Charlie and I will be having breakfast and heading off to the health club. Loaded scrambled eggs with ham and homemade salsa are on the menu for breakfast. Our tailgate party and dinner yesterday with TY and SY was super. The food was delicious (all kinds of veggies with ranch dip, a several-layer Mexican dip, followed by a trout dinner), and the company was great. Yesterday was a perfect, blue sky day around 80 degrees, and the trees are finally starting to turn here. Midweek is expected to be COOL, with highs in the 50's! Lyn, regarding the Amish and their shoes... They don't wear shoes most of the time, and when they do, the ones I have seen look like they are store bought. Some of the women seem to wear the same shoes as the men do - clodhopper type work boots. No, I have no interest in making shoes, though I would like to learn how to decorate leather with pictures and patterns that I see on leather handbags from Mexico. I have several Moccasins that need to be restitched in the toes, and I mentioned in another blog the shoe repair guy wants $7 per shoe to repair them. I might as well get new ones on eBay at that price. I dreamed last night that Lyn and I were going to a concert or opera or something. It was a matinee, because I remember that it started at 1:30pm. Lyn had mailed away for her ticket with some kind of coupon, and I hadn't, so I had to go to the ticket window and try to get one at the last minute. The guy at the ticket window swiped my credit card and typed in $3345 for ONE ticket. I protested, and he took the price down to about $1000. I was trying to figure out in my dream how much the ticket SHOULD have cost! The only other funny thing I remember about the dream was the location of the ticket window. Instead of being under a theatre marquee sign, the ticket window was on the corner of the building under a big neon 'Subway' sign (as in Subway sandwiches). This morning I remembered another dream I had earlier this week. There were two dirt-and-gravel roads running parallel to one another down a long hill. The one I was on was dry and firm. The other road was wet and the dirt and rocks were moving like a continuous mudslide. What do you think of that? Gonna go cook breakfast, have a nice Sunday! Day 607 - Assumptions will get you every time! Greetings, Bloggy Weekenders! It's Saturday, and that's a beautiful thing. We're going to watch football and have TY and SY over for a trout dinner. YUM-O! A couple of things I never expected have occurred. Should I have assumed differently? Okay, okay, it was an email from one of my Team, written on behalf of the puppy, requesting personal time off to take her to the vet because she had worms. That's a first. I looked inside one of my beautiful, Native American inspired, always on my feet Minnetonka Moccasins only to read 'Made in China'. Heartbreak! Betrayal! Uck! Blech! What the *&^%$$! I've been misled (or made an A** out of myself by assuming these were made in America where the Native Americans ARE). So now do I have to worry that my Native American Minnetonka Moccasins have some kind of contamination in them from China? Is that the REAL reason my brain isn't working anymore? Sheesh. Side note - Evidently only some styles are made in China, they have a factory in the Dominican Republic too, and I don't know where else. Well, I went to look - they don't quite have the style I wear the most from Minnetonka. 'Nuff said about that subject! Have a nice Saturday! Day 606 - We love you, Friday! Greetings, Bloggy Celebrants! It's Friday already! YES indeedy, Friday be here! Wait a minute - I have to go make my Foame' Latte' all by myself because Charlie has already left for 'da woods'. I just made my Foame' Latte' in the coffee mug Charlie got for retirement. It's an oversized, ceramic, blue and white mug. Nice! Just checked my emails at work regarding my overnight jobs - one's done, one isn't. I have 2411 emails (yes I have read them all) in my Inbox. I think I need to clean out my email. How about those Red Sox last night? Great pitching if you ask me! We'll live to see another game of the playoffs. By the way - if you've never seen the baseball movie 'Major League', it's hilarious. Wild thing, you make my heart sing! More strange dreams last night, but I don't remember them well enough to tell about them. If I thought about it for a while, I might remember, but then again, I might not! Have a great Friday, everybody, and a great weekend! TTFN! Day 605 - Thursday already and Survivor Night! Greetings, Bloggy 'wondering where the work week went' Workers! I finally completed a 4-part training course at work, I had to make up a class due to vacation, and that class was yesterday. It is the 'Potential Leadership Series', we have a graduation ceremony next thursday, and the head of the company is the Master of Ceremonies. 'PLS' sounds a little like 'OCD', doesn't it? Anyway, I have learned exciting things like 'Behavior Unaddressed is Behavior Unchanged', and that my negotiation style is 'Collaborator-Strategist'. Are you impressed? Gas gauge update - half full, or half empty - whatever your preference. Hey - it's getting late already so I need to make this short. More strange dreams last night - I had to use this ancient firebuilding technique to get a fire going in an outdoor area, so I could boil water to make LASAGNA. I had lasagna for supper, so I think that may have something to do with it. Day 604 - Wednesday and Wierd Dreams! Gas gauge update - several 'digital bars' down now after 150 miles. I had some STRANGE dreams last night! Anyone want to guess what they mean besides more signs of dementia? There was a circular area filled with oversized commodes (most in desperate need of repair) that had a door on either side of them. People were using them as seats to play card games, and there were even casino-style dealers at one 'station'. You would have to close both doors and know that there were people right next to you playing cards while you used the commode. Dream #2: Birds. A little bird was flying straight at me like a bullet. Yes, I dodged. Someone else (Charlie?) was using another little bird like 'bait' on a string to catch a bigger bird that conceivably was going to eat the smaller one. I only saw the 'baiting' part of the dream, not the catching. So - PONDER THAT, WHY DONTCHA? TTFN and sweet daydreams at work! Day 603 - At last! A declining gas gauge! Greetings, Bloggy Twofer-Tuesdayers! And Happy Boss's Day! ...Signal the gospel choir to start singing 'Oh, Happy Day'. Sway along with us! At long last - the waited-for miracle has occurred. My electronic gas gauge is showing ONE less vertical bar after travelling over 100 miles. Can you be happy about NOT seeing something? Well I am. Speaking of electronic issues - I have yet another story to tell. I never got around this weekend to telling you about our brand new 2x cyclonic action super duper Bissell Velocity vacuum cleaner...that was roaring furiously while it was happily spitting all the dust and dirt back into the house. Issue #1 - the very large, clear dust and dirt tray that looks like a food processor container was not 'bolted in' quite right, so there was some leakage going on there. The front of the vacuum is now all dusty. I would leave a trail of dust bunnies behind me as I went through the house, and I was getting very hot from all the effort! Thankfully Charlie figured out the missing connection, because neither of us remembers where we put the manual when we unpacked it. I am working from home this morning to try to make progress on that same project I keep starting and stopping. Wish me luck! I am either going to stop on the way to work to get some treats for Boss's day, or I'll make cookies before I go in. Greetings, Bloggy Commuters (except for Charlie)! I have been 92 miles since my last fillup and my gas tank still reads 'full'. When is it ever going to start decreasing? Maybe it's like a car I used to have - the needle marking the fuel level would go way over full, so it would technically read 'full' for a long time. That sounds pretty obsessive, doesn't it? I can't stop looking! Don't LOOK, Karen. Don't LOOK until it's LOW! A watched pot never boils! Joe - regarding yesterday's comment about my misspelling - yes, you're right, good catch. Temps will be back in the 80's today - Charlie and I both have short sleeves on today. No Cracker Barrel tonight - I need to swim off all the food I ate Saturday and Sunday instead, and Charlie has to fast later for a cholesterol screening on Tuesday. It's the middle of October already - the supermarkets have their Thanksgiving displays up and sweet potato prices are heading down for the holidays. By the way - if you like sweet potato fries, Alexia makes WONDERFUL ones, sold frozen. They are also low in sodium. YUM-O! We had meatball subs (with mushrooms, onions and cheddar cheese) on whole wheat rolls with a side of sweet potato fries for dinner last night. Good football-watching food! Speaking of meatball subs - Charlie has a chip on his shoulder regarding Subway Meatball subs. Many moons ago, we were on vacation and got meatball subs at a Subway in Florida. The meatballs kept falling out of his sub and he was very aggravated by it. We still laugh about it. TTFN folks! Happy Monday and maybe my gas gauge will decrease today! It's Sunday, and that means it's a good day for a confession. Charlie and I will be leaving soon to go pick up my car at the dealership - WHICH HAD NOTHING WRONG WITH IT. What is wrong is MY BRAIN. I told you yesterday that my gas gauge was 'stuck on full'. It wasn't. When I looked online at my credit card bill yesterday (after the car was already in the shop with the mechanics running diagnostics on it), I had filled my car up Wednesday. Thursday I tried to fill it again - it was already full. This is when I started worrying that it was reading full erroneously, because I DIDN'T REMEMBER FILLING MY CAR UP WITH GAS THE DAY BEFORE - THAT IS SO PITIFUL AND SAD! My poor brain is buried in queries and work at the moment, and until I unload that stuff and catch up, I am going to be in trouble. I think this confirms that when I DO get older, I am going to have severe dimentia. Apologies in advance for all the things I'm about to forget, before I forget them! Day 600 - A Milestone in Bloggy Achievement! No, I haven't hit 600 home runs or bowled 600 in 'n' games. But I have been writing the blog for 600 days now. Wowie Kazowie, Batman! Hey - I have an ISSUE with my new Honda CR-V 4 Door Color White! My digital display that says how much fuel I have is stuck on 'Full' (which I know it's not). This is very odd, and an even stranger thing is that when I try to put in gas the gas pump keeps clicking 'off' the way it does when your tank is full. I googled the internet to see if other people have had this issue - actually I found some entries for Hondas that had their gas gauge reading empty erroneously rather than full. I MADE it take 2 gallons of gas yesterday 'click by click' so I would know I wouldn't run out of gas going to water aerobics and the car dealer. I'm taking it in this morning to be looked at. I stopped at a Goodwill store last night on my way home from work and parked next to a Lexus. I thought that was worth writing on 'da blog'. I made a 3-bean-plus-mushrooms-and-vidalia-onions marinated salad for the cookout this afternoon. Have a great Saturday, everyone and TTFN! Day 599 - Friday Already! OMIGOSH! It's Friday already and I haven't caught up this week at work! Charlie has already gone out the door and it isn't even 5am yet. A hunters schedule is worse than work! He'll come home and nap this afternoon. I dreamed last night that I was in a city, on the top floor of a skyscraper, in a huge all-glass room filled with people. The view of the city and other buildings was spectacular, but the weather was stormy and some of the people were very worried about tornadoes and were looking for funnel clouds. Black, roiling clouds were building and rain was starting to fall. I don't remember any more about the dream. TTFN and have a great Friday and a great Weekend! We have a cookout tomorrow to attend at Charlie's daughters new house. Day 598 - Thursday and Survivorage! Greetings, Bloggy Survivors of the work week! It's Thursday already and I take one step ahead and two steps back. I really need to get CLOSURE on some tasks at work and make progress on others. It was FORTY-ONE degrees this morning, we are having a blast (finally) of cool weather. We are actually ready for it, the heat this summer has been too much. Here it is, mid October, and some seasonal weather might be a nice change from 80's and 90's. I went to the health club yesterday afternoon and there were still people outside on the lounge chairs, tanning in the sun. We have changed our Thursday Survivor Pizza night to Survivor Chili night, and CHARLIE is the one who makes the chili every week. Gee - that means Monday night dining out and Thursday night chili, those are TWO out of seven days that I don't cook! Hey, that's not bad! Charlie was (kidding) complaining yesterday - 'I don't know about this retirement stuff, I never get a day off!' HA! Gotta rock and roll, folks - have a nice Thursday and TTFN! Day 597 - Wednesday is Prince Day! Greetings, Bloggy Pasta Fans! It's Wednesday! 'Wednesday is Prince Day, Hey! What a treat! Wednesday is Prince Day, up and down the street! Gals making noodles, spaghetti and sauce. Putting elbows on the table, even brand new brides are able. This very Wednesday, start using Prince! Hey! If you want to read about the history of Prince Pasta and those commercials, here it is! Is there anything we can't find via Google? Yes, I know there is, but it is highly effective. Have a nice Wednesday, everyone, and have some Prince spaghetti! I have a lovely cup of foame' latte' here, and just finished laughing. Both are positive things! I'm laughing because I just sprayed my hair with Sunsilk detangling spray and it says on the bottle 'Hair duller than your last date?' HA! We had an 'okay' dinner at Cracker Barrel last night, but with the smaller menu to choose from. I opted for the grilled chicken salad, and liked the salad part of it just fine. There could have been a lot more chicken on it for $7.50. I did get water with lemon instead of more expensive tea. Charlie mentioned at the Cracker Barrel cashier station that he wished they would bring the old menu back. The cashier lady said he wasn't the first person to say it. This is an improvement?? Well, gang - better make hay while the sun shines. It is already 70 degrees and humid here. Day 595 - Moanday, Moanday! Oh - that would be everyone except CHARLIE. He is already having a hard time keeping the days straight. He had to rest up this weekend after his busy week of PLAY. We skipped the movie yesterday and had a nice day swimming, dining out with our buddy Joe at the Caney Fork Fish Camp and shopping. We had a crab stuffed portobello mushroom for an appetizer and it was fabulous - served in a frying pan surrounded by rice with vegetables and green onions. I would have that again. Joe had 'shrimp n grits', Charlie had grilled chicken, and I had a seafood pot pie. Weather update: it has been 27 years since we had 90 degree weather in October, and we've done it this week. It may hit 90 again today. Gotta get rollin' folks, it's Monday and I've got a lot to do this week! TTFN! Day 594 - Time for some work...on the closet! I just spent some time moving some items from MY closet to the guest closet, and pulled some other items from the guest closet into a bag for Goodwill. Time to put away the white sweaters and most of the capri pants, even though the past few days have been 90 degrees or so. Today's high is expected to be 91 in Nashville. Can you believe I went to a craft fair yesterday and didn't buy ANYTHING??? I guess it's too early for Christmas in my head, and I think the items there were a tad pricey. I enjoyed looking very much (especially at wood and pottery and jewelry) but wasn't in the mood for buying. I think others felt the same way. When I left the craft fair, I specifically looked around me at the other folks leaving. I looked for quantities of bags and packages, and hardly saw any. I wonder if they'll have it again next year if they don't have a good financial turnout? We had an excellent prime rib, salad and potato dinner last night at Texas Roadhouse (the prime rib wasn't as rare as I wanted it to be, but it was delicious). The UT Vols football game was in progress at that time, and there was a musical accompaniment to our meal of people cheering or moaning as various plays were executed. It's Sunday, and we have another fun day planned! First some swimmage at the health club for both of us, then a movie (Resident Evil - Extinction, it's a zombie movie)at Opry Mills Mall, then lunch out at the Caney Fork Catfish place, then some shoppage, then home. How does THAT sound for fun? Have a great Sunday, everyone! Day 593 - Prime rib for me! Gifts Charlie received yesterday included new workout clothes to put in his new gym bag- Champion jogging pants, shorts, and two shirts that match the pants and shorts. It is quarter of 7 and I am just having my foame' latte' from our new coffeemaker - another gift I gave Charlie for his birthday, but it's because I wanted a new one and the more presents the merrier. The old coffeemaker aggravated me because I couldn't take the lid off the carafe, and it never looked clean anymore. I would put it in the dishwasher occasionally by propping it up in a corner of the dishwasher 'standing on it's lid' and hoping it wouldn't break. Agenda for today - water aerobics, then a craft fair, then watch some football, then go out for a delicious dinner at Texas Roadhouse. Sound like a great day??? It will be! Have a nice Saturday and TTFN! Day 592 - Happy Birthday to Charlie! It's Friday already! Another week that has flown by. Today is Charlie's birthday, and he left the house this morning at 4am to go hunting. I started singing 'Happy Birthday' to him at 4am and he made me stop. I wonder why? He'll open his presents tonight - he already knows that two of his gifts are a gym bag and lock for his locker at the health club. Mom- he opened your birthday card and one of his from me last night. Thanks! He's going to need to stay home a few days and rest after this busy week. He'll be more tired than if he'd gone to work! We're going out to Texas Roadhouse tomorrow night for Prime Rib or Steak, whichever sounds best. They both sound pretty darn good. We rarely eat prime rib, and normally just eat steak if it's on a steak salad. Speaking of steak and steak salad - we went to Logans Roadhouse this past Tuesday night for steak salads (since Cracker Barrel took them off the menu). A 20 oz BEER for Charlie was $2.75, and my iced tea was $2.09! I would say that the beer was a much better buy! I think I should switch to water with lemon. Two dollars for a glass of iced tea is ridiculous. It's Survivor Night! Both of our VCRs have straightened themselves out, by the way. The miracle of technology. Charlie and TY had a GREAT fishing adventure yesterday! 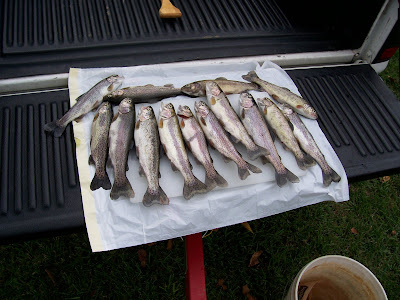 Proof is in the picture - two limits (7 per person) of trout, and they caught others and released them. They hit the breakfast buffet at Shoneys in Lewisburg on their way to the Elk River, like any practiced and true retirees would. No hurry in retirement. They were almost the only folks fishing - everyone else was at WORK. The fish were not far from the boat ramp - they happened upon a spot that was teeming with fish, and stayed there. Charlie said sometimes they got a bite on each CAST, and they didn't need to chum with corn at all. Unbelievable. We'll have a big trout dinner soon with TY and SY and enjoy as many of those fish as we can hold! Have a great Thursday, everyone, and Nancy - don't forget to tape Survivor! Greetings, Bloggy Workers and Bloggier Retirees! Charlie is going trout fishing with TY today while I'm at WORK. Lucky dog, lucky dog. He's already got the boat ready and canned niblet corn for 'chumming' the water to bring up the trout. That really does work, by the way. Yesterday was another busy day, and I am running on adrenaline at the moment. Where are you, Friday??? Goodness, it is 6:06 already. This is going to be short! On Wednesday nights I like to watch the 'Kid Nation' show - very smart kids. Both of our VCRs decided they want to act up today. Why BOTH? Murphy's VCR law? I am seriously ready to get TiVo and have IT record everything. SERIOUSLY ready. TTFN, sorry for the brevity, and have a nice Wednesday! Charlie is now officially a member of Prairie Life Fitness Center. This was his retirement gift from me. We met at the health club yesterday afternoon for a nice swim when I got out of work. Side story - I was in the locker room in my swimsuit, and one of the employees came through warning everyone (that would be me and one employee) that two men were about to come in to check the women's jacuzzi. When they walked in, I got the chance of a lifetime - to shriek 'Eeeek! Men in the locker room!' like they do in the movies. They thought it was humorous - or maybe they were humoring ME. Charlie and I drove home in separate cars, of course. So - this morning, I found his swimsuit and aqua shoes in the bathtub, still wet. The suit is hanging up now on the guest bath towel rack to dry. I asked Charlie 'did you see the swimsuit dryer they have in the locker room'? I explained how it works and where it should be located. Changing subjects - we ate at the 'Sultan Table' mediterranean restaurant last night with TY and SY. There weren't many patrons there, and we enjoyed having a quiet and uncrowded environment. We had appetizers - hummus and pita bread, and fried mushrooms - which were listed on the menu as 'bread and mushrooms' - pretty funny. Our waitress was 17 and knew nothing about the food items. The owner came by several times to answer questions and tell us that the food is all homemade. We ordered several different platters - Grilled salmon and salad for SY; the Istanbul Platter for TY which contained a skewer of chicken, a skewer of beef, and some lamb chops; a gyro platter for Charlie, and a Mediterrenean combo for me that had both gyro meat and chicken. We all shared one baklava for dessert (just a taste each but very good). Greetings, Bloggy Moan-dayers! (uh – except Charlie, who now LIKES Mondays). Happy October! Time to take out my little ghost soap dish in the guest bathroom. My bats and jacks Halloween pretzels are still a hit at work. Since I don’t have anything else to talk about – let’s talk about Quilts, shall we? I have a few quilt stories. My last quilt story might be my imagination - back to the forgetful blog of yesterday! I *think* I gave Lyn a quilt calendar, and I *think* she used the pictures in the calendar to make a gift or thank you card for someone. Is that right, Lyn?